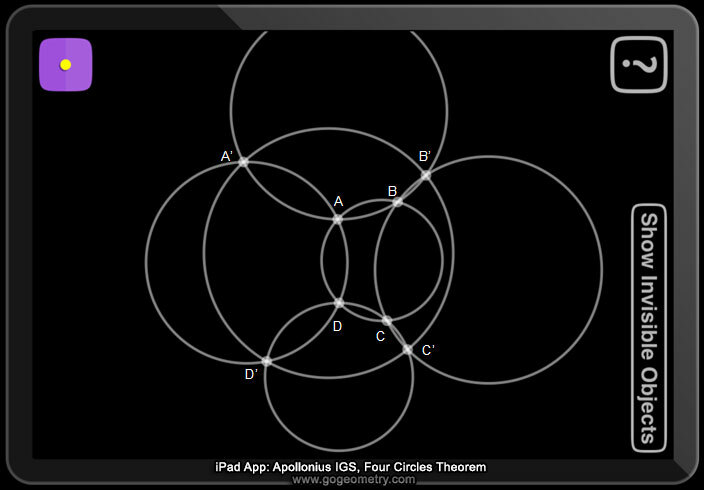 iPad Apps: Apollonius Software. Four Circles Theorem with Dynamic Geometry. Concyclic Points, Cyclic Quadrilateral, Intersection Points, Common Chord. Level: High School, College, Mathematics Education. Distance learning. I drew the geometric construction above using Apollonius for iPad. Apollonius is an interactive geometry app (IGS, or Dynamic Geometry Environment, DGE). It allows you to create geometric constructions, such as those that can be made using a ruler and a compass, and subsequently move parts of your constructions to explore the relationship between the geometric objects on the screen. Apollonius is inspired by software such as GeoGebra, The Geometer's Sketchpad and Cabri, but its interface is especially designed for touch screen. Download on the App Store: Apollonius for iPad - Adolfo Rodriguez.